Congrats to Will Potter! 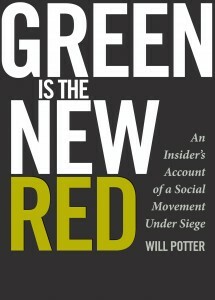 His debut book, Green is the New Red: An Insider’s Account of a Social Movement Under Siege, has recently been nominated by Kirkus Reviews as one of the best nonfiction books of 2011. I was first introduced Potter’s work through articles he wrote for Satya Magazine on the “chilling effect” of the government crackdown on activists. Potter had been researching how animal and environmental activists became the FBI’s number one domestic terrorist threat. He had also provided testimony against the Animal Enterprise Terrorism Act. Since then, he has been reporting actively on what he calls the “Green Scare” on his blog, and last April, his book compiling years of research was released. Green is the New Red is a thought-provoking and riveting read that examines several legal cases against activists. He gives particular attention to Operation Backfire, a series of arsons that took place in the late 1990s, as well as the activists arrested for their campaign to Stop Huntington Animal Cruelty (SHAC7). The book opens with the story of Daniel McGowan, who is also the main subject of recent film If a Tree Falls: A Story of the Earth Liberation Front. Potter has tracked several of these activists from their trial through prison, and for some, even after. He examines the set of forces that led to their arrest and sentencing and how the word “terrorism” has been applied to property destruction (even where there was no loss of life) and free speech activities. Two of the activists he writes about, Andy Stepanian and Daniel McGowan, were sent to “Communication Management Units.” Alia Malek wrote an important piece about CMUs for The Nation earlier this year. In such places, communication is severely restricted compared with the general prison population. CMU prisoners only get one 15 minutes phone call a week, and can’t have any physical contact with friends and family who come to visit. But he later notes,“The best way to cut through the fog of fear is to shine a light directly on the source,” which is exactly what Green is the New Red does. Released in the year of several global political uprisings and the Occupy Wall Street Movement, Green is the New Red is particularly relevant and insightful reading for all concerned citizens questioning corporate power. See more about this on Will Potter’s blog. Posted in books, Writing and tagged activsm, OWS, writing.